July was truly summer time up on the roofs – hot, muggy, sunny, buggy. I have to remind myself that all of these distracting things are the ones I miss during the cold winter months. The fact that the green roofs are pretty darn beautiful makes up for it! 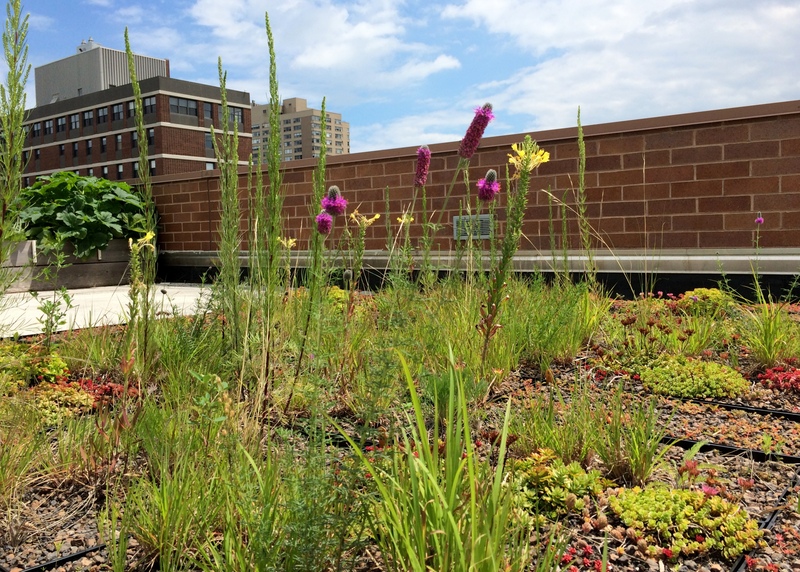 My prairie plants are beautiful when they’re blooming up on the green roof! 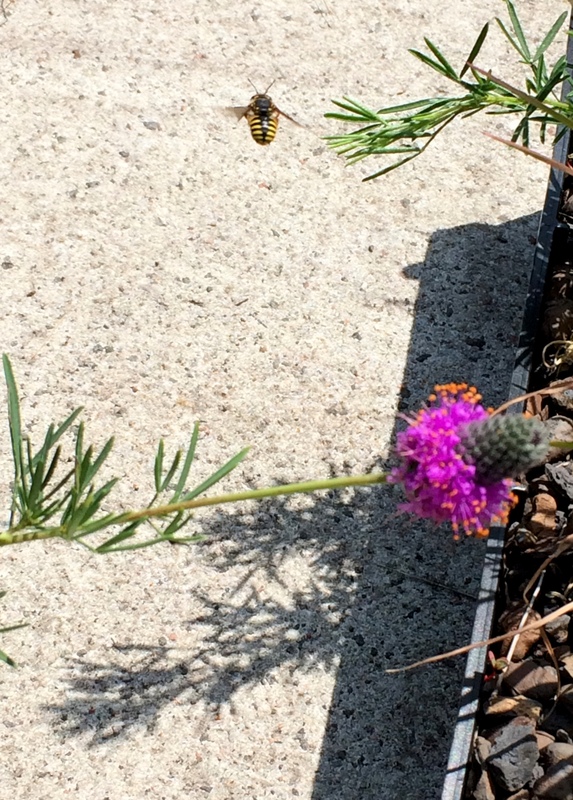 A native bee from the genus “Anthidium” visits my blooming prairie plants on the green roof. The good news is that most of the plants have enjoyed the rainy July and are still looking quite well. Some species that weren’t looking too good last year at this time now have flowers. This means that they’re reproducing (or trying to anyway) and that there is a good chance that their offspring will be around on the green roofs next year. With my experimental green roof trays, I conducted the water retention and evaporation experiment again that I’ve described in past blog posts. Conditions need to be totally dry to do this experiment and with the extra rain in Chicago this month, it was tough to schedule this in. But, with help, I just barely made measurements before it started to rain again and was able to get the data I need. I think I’ve collected enough data from this experiment this summer to make some interesting conclusions, but I’ll have to see. Maybe I’ll do it again next summer to compare the effect of the plants when they’re a year older? We’ll have to see. For my other experiment that measures the movement of pollen between green roof populations, I continued to cover flowers in florescent dye and look for movement of the dye by pollinators. Unfortunately, after trying this experiment on 8 different days, I didn’t see any evidence that the pollinators were moving the dye. Does this mean that they’re also not moving pollen between plants on the green roofs and the ground? I’m not sure. 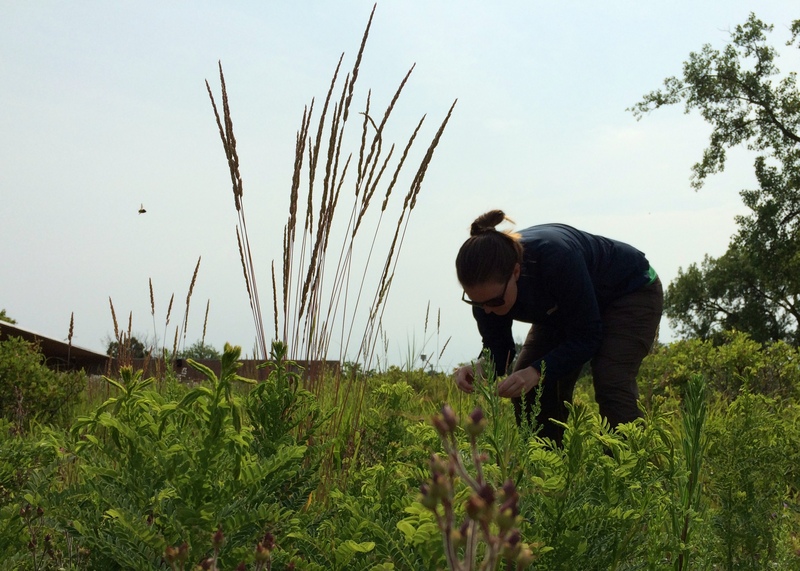 I’ll collect seeds from these plants and use DNA-fingerprinting techniques in the lab this fall to find out more information. For now, the plants are finished flowering and have all been moved from their ground-level or roof sites to be watched until their fruits ripen and I can extract their seeds and DNA. Aside from being attacked by a colony of biting ants (over 20 of them that somehow crawled into my shirt – talk about uncomfortable! ), things seem to be moving along.